This is just an amazing picture. This shift was set in motion by the Immigration and Nationality Services Act of 1965, which dramatically changed the racial system of immigration into the U.S.
Lyndon Johnson stated, "This bill we sign today is not a revolutionary bill. It does not affect the lives of millions. It will not restructure the shape of our daily lives." And yet it has, and America is far richer and more turbulent because of it. There will not be, comparatively, many Asians or Africans entering this country... Since the people of Africa and Asia have very few relatives here, comparatively few could immigrate from those countries because they have no family ties in the U.S.
For better or worse, he was wrong. If you believe like I do that America isn't just a mere pan-European project, but something unique that has roots in the entire globe, you'll think this was a good idea. PS: why do some people use the word Hispanic, and others Latino? In New Mexico, where I grew up, very rarely was the latter heard; and yet in California it is the opposite. Surely there's no difference between NM and CA in how many non-Spanish-descended Latinos---that is, non-Spanish inheritors of the Roman Empire in the New World, such as the Portuguese---there are. Or at least those who would want to claim the term Latino. Of a group consisting of a Brazilian, a Colombian, a Mexican, a Spaniard, and a Romanian; the Brazilian, Colombian, and Mexican would all be Latinos, but not the Spaniard or the Romanian, since neither Spain nor Romania are geographically situated in Latin America. Conversely, the Colombian, Mexican and Spaniard would all be Hispanics, but not the Brazilian or the Romanian, since Brazil was colonized by the Portuguese, and neither Portugal or Romania are extensions of Spain. Finally, all of the above nationalities would all be Latin, including the Romanian. But again, this doesn't explain why the term is used differently in NM and CA, since they are fairly similar demographically, at least among those who would be fighting for the term hispanic or latino. So, I suspect this is arbitrary, a bit like the soda/pop division. In 1975, Caspar Weinberger — then Secretary of Health, Education and Welfare — created the Ad Hoc Committee on Racial and Ethnic Definitions that decided that the U.S. Gov't would use the term "hispanic," rather than "latino." This is from a recent "Ask a Mexican" column which also explains that Mexicans don't use the word "hispanic" because 1) they usually self-identify as Mexican; and "the history of 'Hispanic' involves two attributes Mexicans despise: political correctness and a clueless bureaucracy." Others of Latin American-origin have told me that they don't like "hispanic" because it's Spain-centric, which they think ignores the contributions of indigenous people of Latin America and wipes clean the now-dramatic differences between Latin American countries and their former conqueror. As the "Ask a Mexican" article discusses, most Latinos self-identify as a native of their home country; not their home region. Whenever possible, I try to talk of an individual in the same way, and (as you may have noticed) use "Latino" when I have to generalize, primarly because I think it's the least-offensive. 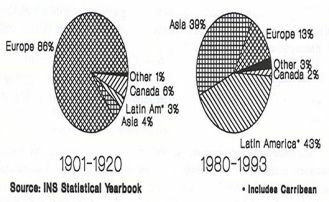 One other possible reason why Latinos tend to self-identify with their country of origin is that in many school textbooks (in Chile, Venezuela and Peru, at least), South America isn't designated as such; instead, the entire Western Hemisphere landmass is designated "America" or "the Americas" (on a side note, South Americans I talked to about this also say that there are just 5 continents - they don't count Antarctica, perhaps because both Chile and Argentina claim parts of it). I have no idea if this different notion of geography has anything to do with it, but it is interesting.